I’m pretty sure I was the only kid in my first grade class that sent out handwritten Christmas cards to friends and family. It’s always been the thing that kicks off the Christmas season for me. This year, I had my cards printed in September. I’m not the early bird because I want to be the first Christmas card in your mailbox… it’s just that I’m excited about sharing joy with people I love. Every year, I get all of our cards out from years past and look through them as a way to walk down memory lane. My husband, Bo, and I always comment about how young and well rested we looked before our kids came along, or how much our little girls have grown up, etc. One of the kids always has a grumpy face or I’m holding a Kleenex because I was nursing a cold. They’re just fun to look at and reminisce on days gone by. But this year as we were looking over our lifetime together, as represented in glossy photo cards, I feel as though God made a new impression on me. These aren’t just greeting cards or cute photos of my family. This is a visual timeline of our life together. These are milestones of our highs and lows, and we can see God’s faithfulness and blessing through each and every image. Even the one with the grumpy face or the Kleenex. There’s the card where Bo and I are cuddled up on our front porch bench with our faces beaming with pride for our first home purchase and with love for each other. I know behind my smile, I was struggling with an overwhelming amount of grief as that photo was taken only four short months after my mom lost her life to breast cancer. Although you can’t see it in the photo, our hands were calloused from renovating our home for countless hours. Our eyes were sore from working full-time and going to grad school at night. I can see now that God had blessed us with a roof over our heads, great jobs, and the opportunity for continued education. And even though I still miss my mom every day, I’m reminded of how deeply grateful I am for the years I had her in my life. Another year, our card had a photo of the two of us gazing into each other’s eyes with big cheesy grins on our faces. What you can’t see in that photo is that we were desperately praying for a baby, and I was beginning to think children might not be in our future. The economy had also taken a downturn and the law degree my husband had just earned wasn’t proving enough to find a job in the legal field. He was depressed and without a job in sight while I felt the weight of the world in supporting both of us. I can remember praying without ceasing for a child as well as a job and self-confidence for Bo. 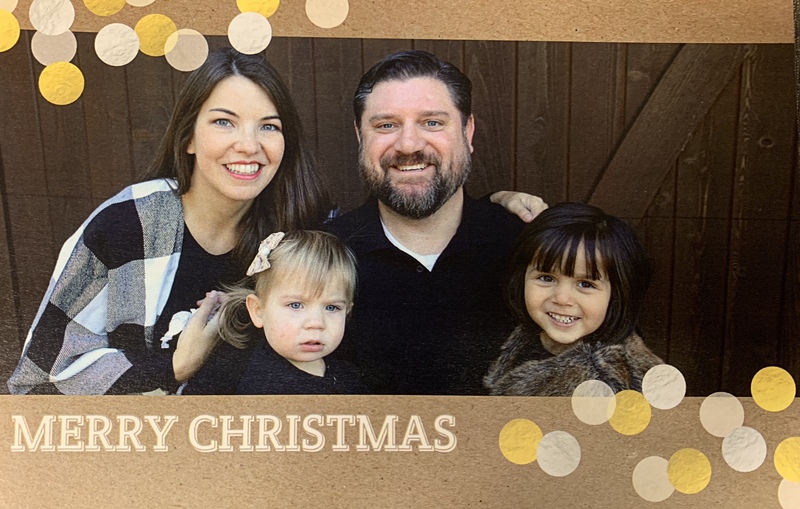 The very next year, our card gave some stats about our year, and one of them was: “God graced us as licensed foster parents.” Another was: “Bo landed his first attorney job.” In a short trip around the sun, God led us to become foster parents and gifted Bo with a job that suited him well. Things were looking up, and I can now see the faithfulness of God and the abundant ways He blessed us that year. The following year’s card has the two of us holding our foster baby. With chubby cheeks and a mop top of jet-black hair, we were smitten with her. Behind those elated foster parents’ faces were some incredibly scared people. We feared we would lose her and prayed constantly that we would be able to adopt her one day. The little bag of her belongings set in the hall closet just in case CPS called to take her to another home. I’ve never prayed so much as I did that year, and I now see that I became closer to God that year than ever before. That card serves as a reminder of our early days as parents of a tiny person. We were learning new things every day just as she was, and our hearts exploded with love for someone who didn’t come “from” us as we always thought our child would. In our next card, we held our adopted toddler and my pregnant belly, surprisingly, swelled with a growing baby girl inside. Our prayers had been answered two-fold! We were able to adopt our sweet Alli Grace and just two days before we stood before the judge, we found out we were pregnant with a baby girl. It goes without saying, God’s blessings were apparent that year – then and now. By the next year, we held two little girls in our arms in our Christmas card photo. For the back of the card, I selected Psalm 126:3, which said, “The Lord has done great things for us, and we are filled with joy.” I knew it at the time, and I see it even more so now, God blessed us and made our cups run over with love, joy, and hope for the present and the future. Our faith has been strengthened and our testimonies are bolder because of those highs and lows throughout the years. As you check your mailbox tonight and sift through the junk mail for the handwritten envelopes, I encourage you to not be envious of the picture-perfect card you hold before you. Thank God for the joy you see in the photos and pray blessings over the stories behind those faces. You never know what they may be going through in life, but I can tell you that God will continue to be faithful in His blessings to all of us.